Why does orchestral royalty free music have such amazing power to touch our souls in cinematic features? There must be something in our genetic heritage that remembers the days when dozens of people worked together in real time to create music of such immense pathos, glory, and tenderness. From our Royalty Free Holiday Music section the album Holiday Magic features 21 tracks that capture the thrills and energy of the holiday season. A large selection of royalty free Christmas music is complemented by many other classics of the holiday season like Auld Lang Syne and Deck the Halls. Electronic royalty free music gives the widest range of expression of any genre, since any music ever recorded can be reproduced to perfection, then mixed and matched in infinite variations with the flip of a switch. The temptation could exist to just play with all that possibility and never really come up with anything fresh and original. But SmartSound Royalty Free Music never suffers from this trivialization of song, with every track designed to explore and adapt the cohesive whole around your visual creativity. Certain occasions call for no less than the hardest rock you can find! Create an intense and edgy mood in your scene or video production with the angry and extreme power of SmartSound's royalty free heavy metal. At SmartSound, we’ve created a vast library of royalty free music for all your soundtrack needs. As part of our complete collection of popular genres, we offer numerous albums that highlight hard rock and heavy metal. Pop Rock for the 21st century takes in even more ground than during its birth centur(ies)—Indie music has formalized a mid-ground reaction to Heavy Metal and super-sweet teeny-bop, and ballads continue unabated with synthesizer and electronica embellishments. Count on SmartSound’s Pop Rock selections to add whatever piquant note you need for video projects ranging from TV/Film dramas to offbeat Commercials to a more transparent style of Corporate videos. Off-beat music genre, Reggae, developed literally off the beat. Unlike most other forms of music, the emphasis is on the third beat of the measure, instead of the first (downbeat). Its roots hail from Africa, by way of Jamaica, where Reggae was developed in the 1960’s, as well as from jazz, and R&B. The music line is often slower than some other Caribbean styles, but sly and seductive, and well suited for background music designed to put you into a relaxed, stay-in-the-present state. Royalty Free Jazz Music kicks it with over 220 tracks from SmartSound. It sparked the conversation back on December 20th, 2011, and several new albums keep up the tradition of the sophisticated, urban coolness that is jazz. The Royalty Free Classical Music page contains Royalty Free collections of Classical Music. Most of the tracks on these collections were written by composers from the classical period of western music. Bach, Beethoven, Tchaikovsky, Vivaldi, Strauss, Schubert, Chopin, Mozart and more - the music of these composers defined an era. Most of the music on these CDs was recorded from live performances, not produced with synthetic sounds. If orchestral and chamber music is what your looking for the SmartSound Royalty Free Classical Music page is the right place. Cool Jazz from SmartSound swims in and out of consciousness, while continuing to weave its magic of laid-back ambience. From Romance & Memories, “After Five,” evokes elegant evenings of subtle candlelight and quiet entertainment. Jazz Combo and Piano strike an urbane, sophisticated mood in this cool jazz ballad, also an effective background track for narration. If Africa is the cradle of humanity, African music is the cradle of all modern music, with a compelling, incessant beat, and an earthy energy. Pop, rock, soul, R&B, gospel, rap, and hip hop all trace their roots to the primitive soul of the African home. 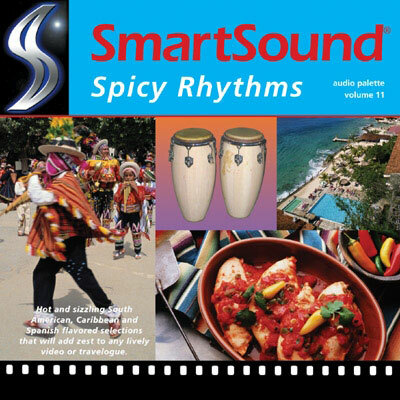 Many Smartsound albums featuring Royalty Free African Music are compilations of several exotic themes around the world, as diverse as they are world-conscious and sophisticated. Check out World Beat for a collection of traditional sounds and contemporary arrangements. Traditional Christmas songs are well represented in SmartSound's Royalty Free Christmas Music, especially in album Christmas Treasures - Silent Night, with Strings and Sax, and Holiday Magic — 12 Days of Christmas. Check out the ethnic-flavored arrangement of We Three Kings, a calm, orchestral version. 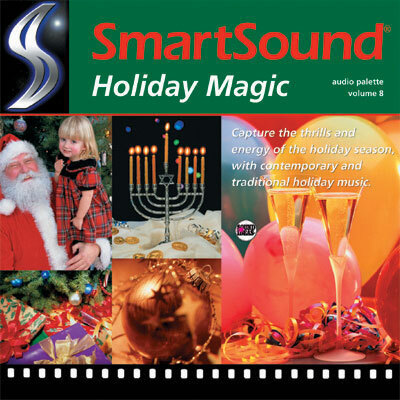 For something different to back up your Christmas scenes, SmartSound brings you numerous offbeat tracks that evoke the season with fun departures from traditional. One of 21 tracks on Holiday Magic, sprightly Two More Days relentlessly chimes out the unbearable anticipation of young kids waiting for Christmas day.